As the year of the centenary of the 1913 Lockout has come to an end; we have created a dedicated section comprising of relevant items of interest. This section consists of articles published by the Irish Labour History Society since its founding. Items from other sources have, and will be added over the coming months so remember to visit our site regularly. Tram workers deserted their vehicles in protest when William Martin Murphy forbade employees of his Dublin United Tramways Company to be members of Larkin's Irish Transport and General Workers Union (ITGWU). Chronology of Events 1913 Lockout and Strike. A chronology of events from the 26th of August 1913 to January 1914 when the striking workers gradually began to return to work. The Lockout ended by degrees. The Dublin 1913 Lockout Article by Padraig Yeats, (Reprinted from "History Ireland" Summer, 2001). The Church Street Disaster, September, 1913. Article by Chris Corlett, (Reprinted from "History Ireland" March/April, 2009). The Dublin Strike: A Speech by "AE; George W. Russell Article: A Speech by "AE": George W. Russell. Delivered in the Royal Albert Hall Nov. 1st, 1913. Nineteen Thirteen � Its Significance. Article by William O'Brien, Secretary, Dublin Lock-out Committee, 1913. (Reprinted from "An Dion" December 1934). 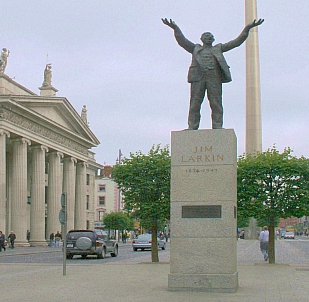 1913 Jim Larkin and the British Labour Movement. Article by Bill Moran. Larkin and the Strikes of 1913: Their place in British History. Article by Kenneth D. Brown. From Saothar, Vol. 9. pp.89-99. 1913 The Dublin Lock-out 1913: The Response of British Labour Article by Jimmy Sweeney. From Saothar, Vol. 6. pp. 104-108. William Martin Murphy and the origins of the 1913 Lockout. Article by Dermot Keogh.